When visiting my Mother we often go out on a Saturday afternoon for what we, in Lancashire, call “a run”. This is not a run in the normal use of the word. It actually means “a run in the car”. This is a low key, local excursion, normally to visit relatives, a public house/tea shop, a retail outlet, or just a drive for the sake of driving. You might stop, get out, wander around a village, or “mooch” around some shops. Anyway Nick and I have made a habit of going out for “a run” on a Saturday afternoon, to check out the fabric shops of Lancashire. 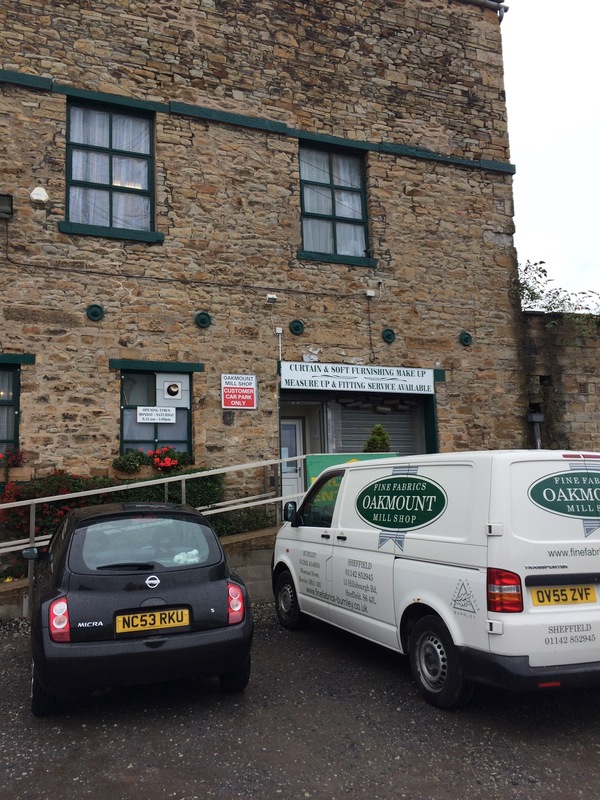 Last weekend I tried Fine Fabrics/Oakmount in Burnley. Like many Lancashire shops it is housed in an old factory of some sort. Oakmount is essentially a furnishing fabric shop. I tend to avoid curtaining shops because, in our London home, we don’t do curtains – relying instead on the original Georgian shutters that came with the house, or pull down blinds. I have never attempted the covering of a sofa (unlike my excellent friend Joyce from Canada), and I can’t even do a good cushion. Did I mention that my father’s business was in fact printing furnishing fabrics in Lancashire? Funny. However, upstairs they have quite a nice selection of nice dress fabrics. If you have kids on the stage or run a dancing school there is plenty of choice here. These Northern warehouses are huge and do seem to have a great deal of stock. They also have very nice staff. This lady told me she was half Italian – the other assistant was fully Italian – and they had an interesting debate about which half was the better half. I was particularly taken with the check fabrics they had on sale in the furnishing department and I bought a metre of some nice purple fabric to take home, as you can see above. 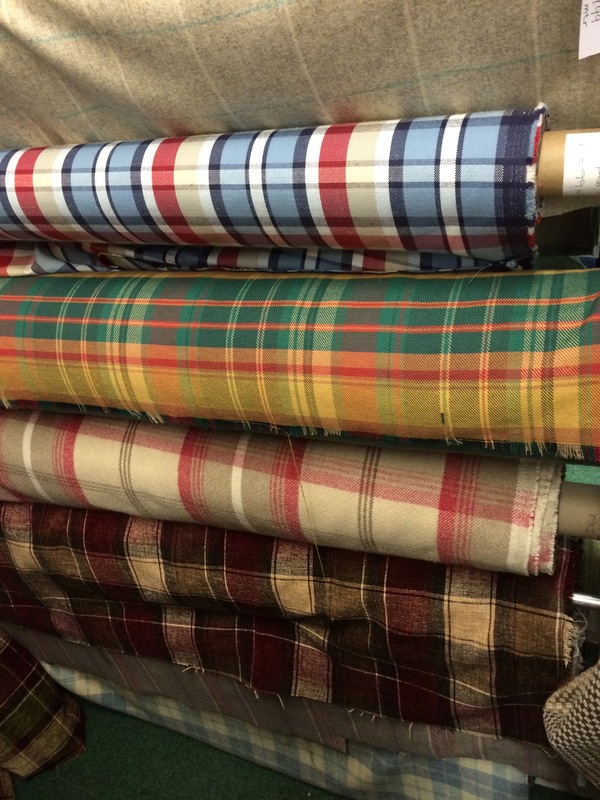 The excuse for visiting the shop was that I was looking for tartan, stripes or checks – in order to create a few Westwood-type skirts. And this shop has got quite a good selection. I didn’t expect to buy furnishing fabric but I think if it is wool, and the weight is OK for you, there is no essential difference. Other than it may have been treated so that it will not burn as easily as normal fabric. While I had a good mooch around my husband sat in the car and listened to the radio. As I was paying the proprietor told me they now have a new cafe with specialities provided by the Portuguese chef – “next time he can sit in our cafe and have a beer instead”. Ooooo I am so envious I could have a field day rushing round Lancashire. When I see rolls of fabric such as in the photos my mouth actually waters. It is lucky for me that it is a bit too far to travel to otherwise I would be there with my tape measure. Enjoy. Mmmmm fabric temptation again! Must stick to the plan though. I used to visit Burnley, in my pre-sewing days. Sounds worth visiting when I next pass that direction (easy to arrange, probably next summer now). In my part of Scotland, we always called it going out for a run, too – though that could be quite a considerable distance! I love the look of the fabric you got Kate. I saw a glimpse of it on your Instagram earlier and it looks as if its going to be a fabulous skirt. Hmmmm Burnley! That’s about 30 minutes away from me! I feel a run coming on. Especially as they have wool AND dance fabric under one roof. And a coffee shop for the hubby. Genius. Thanks so much for the tip. If my stash wasn’t already obscenely huge I would be campaigning for a stop there when I visit family in Northumberland. We used to go for ‘a run in the car’ on Sundays as a family when I was a child. I think it was more exciting then as cars weren’t as widespread. Yes of course – that is why my parents and grandparents thought it was such a great leisure activity! It’s obvious now you said it. Thanks Kim. Looks like fun. I’ll be watching for more of your Westwood inspired skirts. We have ‘runs out in the car’ with no particular purpose! Visiting fabric stores as part of a run out would make it even better! I’m off to the open day at The Fabric Godmother on Saturday, I suspect W will be sitting in the car listening to the radio too! We just had lots of “runs” while my mother visited…absolutely delightful. 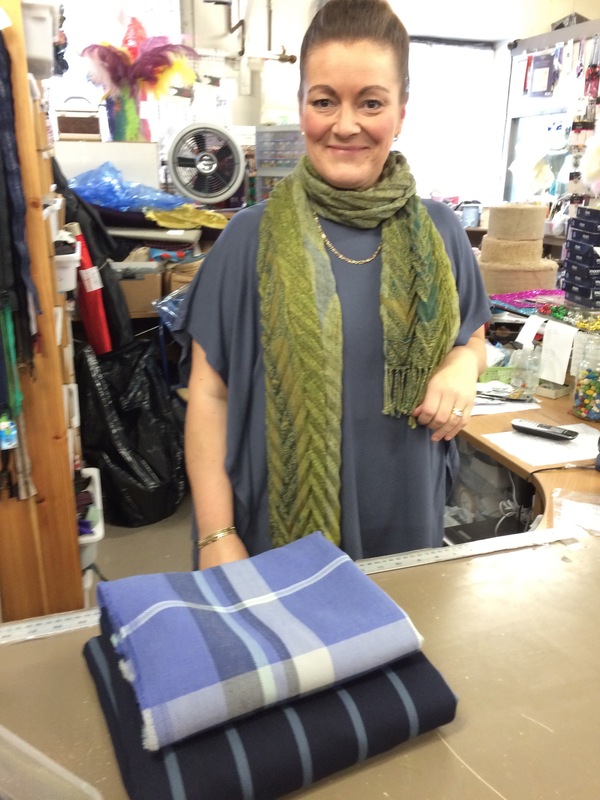 We anticipated visiting a fabric shop, but sadly it was an utter misnomer. Two bolts does not constitute a shop, in my humble opinion. Your woolens look so lovely, can’t wait to see them made up! I agree those plaids are tempting, my hubby has an e reader for my store jaunts. Gorgeous plaids, K, and I like the story about the Italians. I have a Parisian friend who is half French and half Italian. I once said jokingly “Oh the best two possibilities” and she very solemnly nodded in agreement. 🙂 I kept my mouth shut after that. I love the soft grey plaid with the turquoise stripe. I wish I could take “runs” with my mom as we used to do, or with Gianni. I find those little meanders so entertaining.